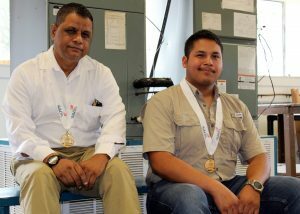 (HARLINGEN) – With the SkillsUSA national competition around the corner, three men from the Heating, Ventilation and Air Conditioning (HVAC) Technology program at Texas State Technical College in Harlingen are preparing in hopes of bringing home the gold. Muhammad Khan, Javier Garcia and Leonel Garza Jr. will be traveling this weekend to Louisville, Kentucky for the SkillsUSA National Leadership and Skills Conference. SkillsUSA is a professional organization teaching technical, academic and employability skills that help high school and college students pursue successful careers. Members build these skills through student-led team meetings, hands-on competitions, leadership conferences and other activities. Khan wants a chance to redeem himself. Khan is attending the SkillsUSA national competition for a second year and again competing in the Sheet Metal Technology category. Last year he came up short of a gold medal, but he hopes to change that this time around. The Los Fresnos native has been preparing tirelessly alongside his HVAC instructor Rogelio Longoria. During competition, Khan is required to design a duct layout, cut the sheet metal and build the duct, so that’s exactly what he has been practicing. Garcia, on the other hand, has found success in a non-related HVAC category: Robotics Urban Search and Rescue. The Brownsville native and his partner Martin Ramos from Mechatronics Technology are the only robotics team representing Texas so they have been working overtime to ensure their remote control robot is ready for competition. The next challenge for the men will be to prepare their robot in one hour at the competition to complete an obstacle course, find and lift a fake bomb. Last but not least, is Garza. He will have an entirely different experience at SkillsUSA from his peers. The McAllen native who is president of the TSTC SkillsUSA chapter, is also HVAC Technology’s first state officer. He is one of six students representing Texas at the national conference. 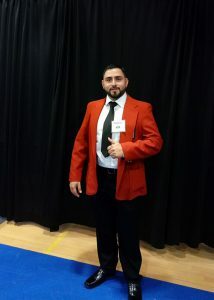 At the state competition held in Waco earlier this year, Garza applied for the position, ran a campaign and had to address at least 200 SkillsUSA delegates in hopes of receiving the majority vote. As a state officer, Garza will serve a one-year term and will be responsible for helping SkillsUSA coordinators with conference logistics, preparing meeting and competition materials, preparing conference tote bags, grading competition exams and purchasing food and supplies. This is Garza’s second time being elected state officer, but last year he had to forfeit the position because he was about to become a dad and this year he will miss his son’s first birthday. Longoria, the men’s instructor, said he is proud of what they have accomplished in SkillsUSA this year and most in part because of the men’s hard work, time and sacrifice. Khan, Garcia and Garza will join at least 50 other TSTC students statewide at the week-long event, June 25-29.